Finding skilled workers to fill the growing vacancies is proving to be quite difficult, particularly in the plumbing and heating and cooling industries. By 2022, the worker deficit is expected to be 138,000 which will spike the employment opportunities to grow to by 14%. That means there will be a lot of qualified HVAC technicians missing from the workforce. Based on supply and demand, now is the perfect time to consider becoming an HVAC technician. Read on and explore the facts about becoming an HVAC technician. Check your local HVAC program listings. HVAC is an acronym for Heating, Ventilation, and Air Conditioning. It’s much easier to just say HVAC as opposed to going through the whole list there. Essentially, HVAC technicians work on all those systems in a building, both residential and commercial, and in certain types of vehicles, that keep the climate comfortable year round. The meaning and definition of HVAC is consistent across the United States and within the industrial sector but the certification qualifications may vary by state. HVAC technicians provide service to residential and commercial buildings climate control systems: heating, ventilation, and air-conditioning units. The HVAC technician may be needed to repair, replace, or install the components that supply the heating and cooling to buildings. The HVAC technician must be certified and follow government regulations pertaining to the heating and cooling industry. HVAC technicians are trained to use a variety of different work-related tools and equipment. They have a more traditional type of toolbox filled with the basics such screwdrivers, wrenches, pliers, and hammers. More sophisticated tools that are part of the HVAC technicians work life are carbon monoxide testers, torches, combustion analyzers, and voltmeters. All of the tools and their workings will become second nature through training and experience. If you were to visit all the job postings for HVAC technicians, employers list the traits they are looking for in their employees. To be successful in HVAC, you need part HVAC skills and part people skills because you are going to be interacting with people first and the HVAC parts that are broken next. Let’s break it down a bit. Techie: HVAC technicians need to be able to decipher and understand blueprints, schematics, specs, and other technical data that goes along with repairing, maintaining, and installing HVAC equipment. They should also be computer literate and be able to use a variety of software programs. Not to mention, the processes of hot water heating, steam heating, air conditioning, and water cooling should be imprinted on their brains. Trouble Shooter: Things happen. And an HVAC technician needs to be able to think and act quickly when issues arise. Whether it’s with having to take care of faulty equipment or issues that occur during a service call, a properly trained HVAC technician will have no troubles with their troubleshooting skills. Talker: Okay, so maybe not a motormouth. There is such a thing as knowing when to be seen or heard. But, a successful HVAC technician should be able to communicate effectively with their supervisors, other technicians, and customers. Also, they need to be able to write as effectively as they speak because they’ll need to document service in reports, and in their customer instructions. Training: HVAC technicians need to have a strong desire toward continuing their training and education. Whether they are trying to stay on trend with advancements in the industry, or pursuing opportunities to advance their career by taking more courses, HVAC technicians also need to be constant learners. Being up to date on industry safety standards is probably a good idea, too. Wish it and it shall be. No, unfortunately, becoming an HVAC technician doesn’t work that way. There are steps to take if you want to become an HVAC technician. You must have your high school diploma or GED. Pass a very basic math test. Either attend a trade school or find a formal apprenticeship for HVAC. Get your license. Each state has different requirements. Get yourself a job as an HVAC technician! Through these apprenticeship programs, you’ll be learning how to read and use blueprints, best job safety practices, the use and care of the tools, and ventilation and air-conditioning system designs. While doing an apprenticeship is certainly a viable option, unless it’s through a trade organization, it’s becoming less popular because more employers are leaning towards hiring HVAC technicians that have been trained through a trade school or community college. Trade schools take six months before you can get your certificate while community colleges will take two years. In both instances, you’ll take courses in classrooms, as well as be exposed to hand-on, practical learning. It’s a very well-rounded education where you’ll learn the fundamentals of electricity, the properties of gas, solid fuel and oil boilers, furnaces, ducts and piping, work-site safety practices, and control systems. Some states will require you to have completed an apprenticeship or have 2-5 years worth of work experience before you can be licensed. There is also an additional certification that the Environmental Protection Agency requires if you’re handling refrigerants and that would be an additional $40-$240. The reason for the price discrepancies for the education, licensing, and certification costs is due to varying requirements and regulations for each state. Financial aid may be available and options should be discussed with the financial aid department of the institution you’ll be attending. Learn more about financial aid here. Information specific to HVAC programs and financial aid can be found here. There are a couple different options when it comes to getting your HVAC technician degree or diploma. You can do a hybrid program which is both online and through a school, or there is the traditional attending classes on a campus, either a community college or trade school, your choice. Most programs, however, consist of fairly similar courses. If you are still in high school and are considering HVAC for your future career, load up on math, physics, chemistry, shop, mechanical drawing, and any other courses your high school may offer that makes sense. Principles of refrigerations: Students learn the basics and applications of refrigeration systems, along with the chemical and physical laws of refrigeration. Residential gas heating: This course teaches students about gas-fired appliances, along with troubleshooting and repairs of the systems. HVAC building systems: Here the students will learn how to design and construct comfort control/climate control systems for commercial buildings. Load calculations for heating and cooling systems: Mathematics is a key principle when it comes to effectively heating and cooling a building of any size. This course will teach students how to apply sizing calculations to climate control. Other courses: Theory, design, electronics, and equipment construction, how to use and care for commonly used tools, on the job safety, how to read blueprints, and the theory and design behind all HVAC equipment. Certification is extremely different than licensing. The license proves you’ve successfully completed your training and have the basic knowledge and skills to effectively do your job as an HVAC technician. Certifications, on the other hand, are a step or three above the licensing aspect. With certifications, you prove you have broadened your HVAC horizons and you can choose to specialize in a few areas. The Environmental Protection Agency (EPA) requires anyone handling refrigerants to be certified. Which means all HVAC technicians must have, at the very minimum, the EPA 608 Certification so that they can legally do the bare-bone essentials of their trade, as well as the nationally recognized NATE Certification, and the elite Excellence Certification. Within the EPA 608 Certification, there are four levels. Type 1 allows an HVAC tech to handle small appliances that contain less than 5 pounds of refrigerants (like a refrigerator). Type 2 will allow the HVAC professional to deal with high pressure refrigerants. Type 3 allows the handling of low pressure refrigerants. Universal will include all three: Type 1, 2, and 3. North American Technician Excellence (NATE) Certification: This is one of the highest achievements for HVAC professionals. The NATE Certification is not required however it’s nationally recognized and highly respected. The NATE Certification is obtained through an exam and can be earned in areas such as air-conditioning, air distribution, and gas furnaces. Click this link to take the NATE Certification practice test. HVAC Excellence Certification: To be eligible to earn the Professional level HVAC Excellence Certification, you must have a minimum of 2 years on-the-job experience and pass the knowledge-based exam. You can also receive a Master level HVAC Excellence Certification. There is a minimum of 3 working years required before you can take portion of the knowledge-based exam. The more certifications you have under your worker belt, the more desirable of a hireable employee you make yourself! Certifications give you even more work credibility because it reinforces to employers and clients that, not only do you know your stuff, but you know it exceptionally well. And, it gives all involved a sense of security that the work is in outstandingly capable hands. HVAC is considered to be one of the best-paid skilled labor careers. The median pay, or the collected average of all HVAC technicians, is $47,080 Entry level, or the lower 10 percent earned over $29K while the top 10 percent, the HVAC technician’s who have years of experience behind them, made an annual salary of $75,330. Again, these numbers are the average. Salaries vary by location and industry so your paycheck could vary greatly from the national average. HVAC apprentices earn about half of what their experienced worker counterparts make. But, the more the apprentice learns and gains in terms of experience, the more they will make. Most HVAC technicians work a full-time position and their work schedule could vary based on their employer. Employment growth for HVAC technicians is going to be much faster than most other occupations, at 15 percent through 2026. Why? Because of two things. One, the construction rate of both residential and commercial buildings is increasing. And two, climate-control technology is becoming more sophisticated which will increase the demand for HVAC technicians skilled enough to work on all those newfangled devices. Our country is short-handed in skilled HVAC technicians. We need YOU! 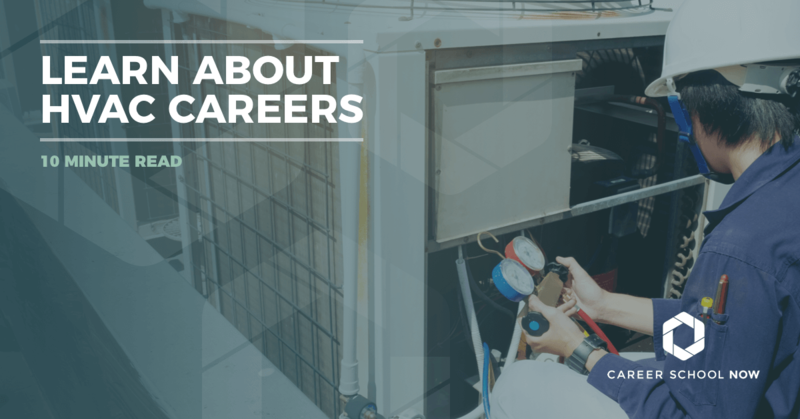 HVAC careers are plentiful and if you’re willing to put in the time and become licensed and certified as an HVAC technician, you should have no problem finding your dream position. Licensing is required in order for HVAC technicians to work. It proves to the employers and to customers that you’ve been properly trained for the job. In order to become licensed, you must attend some sort of training, whether it’s through an apprenticeship, a trade school, or a community college. Once your formal education has been completed, you will take the knowledge-based licensing exam. The test content and length varies by state, as well as testing location. The exam will test you on every aspect of HVAC installation and repairs. All HVAC technicians who work with refrigerants are required to take a licensing exam called the Section 608 Technician Certification. Also, if you choose to work as an HVAC contractor, there is another test you’ll need to take, as well. The licensing exam is given through the International Code Council. Each state has it’s own location where the exam is given. An inactive license is $82.50 and testing fees range from $150.00 - $350.00. Heating and Air Conditioning and/or Refrigeration both active licenses are $165.00 initial fee and $165.00 annual renewal. You may also acquire a license through reciprocity with certain states or through grandfathering until 2011. $30 application fee. $225 license fee. Four years of practical experience two of which in the last ten years, submit financial statement must not have had a license refused or revoked within a year prior, pass exam on building, safety, health and lien laws of the state. Pass trade exam. $150 initial fee, $200 renewal fee. There are no State license requirements for Colorado. Unlimited Heating Cooling Contractors License S-1, Limited journeyman's license, unlimited journeyman's license, limited heating cooling license, apprentice permit. Proof of Insurance, need to be bonded, Must obtain a Delaware contractors business license. Out of state contractors must provide a statement of contracts or have an office or residence inside the state. Must have bond equal to six percent or more of jobs equaling 20,000 or more. Can work anywhere in the state Must have workers comp, must pass exam, must meet other educational or on the job requirements, class B is limited to 20 tons of cooling and 500,000 BTU of heating on any system. Must have workers comp, must pass exam, must meet other educational or on the job requirements. Must contact local government for details, some are different from others, after local requirements are met, a license may be applied for. Have an Iowa employer account number, submit certificate of insurance listing the Division of Labor as the certificate holder for workers compensation coverage. No State License is required for Kentucky Contractors. No state license required for Maine Contractors. Holders of Anne Arundel or Prince George's County license do not have to take exam, contractors providing services for five or more years can get a license without an exam and out of state HVAC license holders can become licensed without taking exam. No state license required for Minnesota Contractors. Except for residential builders, City of Minneapolis requires licensing of HVAC installers. Certificate Required for public jobs over 50,000, private projects over 100,000, under 7,500 square feet and one to two stories in height. Must be 18, complete four years of experience in last 10 years. Four years experience working as an apprentice for a licensed mechanic. Pass written exam. Request monetary limit for work being carried out at any given time, carry minimum liability insurance, and pass open book exam on Utah business and law on specified trade.